Melky Cabrera’s suspension on August 15 for use of a banned substance was a huge blow to the Giants’ offense. At the time, Cabrera was leading the National League in hits and was battling Pittsburgh star Andrew McCutchen for the league batting title. The follow-up drama with the fake site to justify his steroid use added to the disrupting media coverage surrounding the Giants most productive hitter. But in the games since the suspension, the Giants have more than held their own. In three series that included the rival Los Angeles Dodgers and contending Atlanta Braves, the Giants have won seven of 10 games, with a five-game win streak headed with a sweep of the Dodgers in Los Angeles. That was the first time the Giants have swept the Dodgers in five years. Matt Cain has continued to hold up his end of the rotation since the suspension, going 2-0 in 15 innings of work with only 2 ER. Surprisingly, the same cannot be said of Ryan Vogelsong, who led the league in ERA earlier this year at 2.27. Vogelsong has a posted an abysmal 6.39 ERA in the month of August. While there is certainly hope that Vogelsong can rebound, other starters in the Giants rotation have picked up the slack and will be critical down the stretch. Two-time Cy Young Award winner Tim Lincecum is pitching tonight for the Giants. While his ERA is a disturbing 5.30, he has the opportunity to salvage his first month this season with a winning percentage above .500 and is hoping to improve upon a 3.10 ERA since the All-Star break. And after a forgettable start against the Mets at the beginning of the month, the Giants have won all of Barry Zito’s last four starts. While that may have more to do with offensive output during his starts, performances like Zito’s last start (8 IP and two ER in the ninth inning due to Affeldt’s inability to prevent Zito’s two baserunners from scoring) might be enough to hold up the back-end of the rotation. Buster Posey’s batting average is north of .370 since the beginning of July, which has held the Giants offense together—and put himself in the discussion for National League MVP. Hector Sanchez has helped take some of the wear and tear off of Posey, and even though Sanchez’s offensive numbers of late are less than stellar he has proven to be capable of handling the Giants rotation—no easy feat for an inexperienced catcher. Although he may be well under the radar, Joaquin Arias is an important player for the Giants to be successful. During Pablo Sandoval’s mid-season injury, Arias stepped up and his flexibility defensively is something that the Giants are very lucky to have. Hitting .420 in the month of August is not too shabby, either. While a closer-by-committee situation is less than ideal, the Giants do have multiple capable late-game relievers. Bruce Bochy is probably doing the right thing by riding whichever pitcher is hot, whether it’s Affeldt, Romo or Casilla. that Gonzalez has played for. The recent blockbuster trade between the Dodgers and Boston Red Sox may worry Giants fans, but the reality is that it should not. This season, Beckett has 11 losses and an ERA above 5.00. Carl Crawford has had season-ending Tommy John surgery and even though Adrian Gonzalez is a powerful bat in the middle of the order, he is not worth the $100+ million he is due over the next six years. With no other real competitor in the NL West, if the Giants can hold off the Dodgers and continue to get timely contributions from their entire organization, the division championship trophy will soon be sitting in San Francisco. The Minnesota Timberwolves have been sitting on their couches during the playoffs for nearly the past decade. And once Kevin Garnett departed for greener pastures (the Boston Celtics), Minnesota appeared to possess little hope of returning to the promised land. But there is a plethora of talent within the Timberwolves organization going into the new NBA season. Here are (the lucky number) seven reasons that Minnesota will end their playoff drought in 2013. After signing a contract with the Timberwolves for 2-years/$20 million, the Timberwolves have added a versatile small forward who has a well-rounded game. Over the course of his NBA career, Kirilenko has only once averaged below 10 points per game and has a career average of 2.0 blocks per game. His brief stint last season in Russian basketball has really “helped his body…He feels as good as he’s ever felt,” according to Timberwolves president and general manager David Kahn. Also, the retirement of Brad Miller makes the Timberwolves an even younger team. But at 31, Kirilenko will add a veteran presence necessary when Minnesota is ready to make a late-season playoff push. Even with the signing of former Memphis Grizzlies’ star O.J. Mayo, the Dallas Mavericks are on the rapid decline. A mere season after beating the Oklahoma City Thunder en route to an NBA championship, the Mavericks went down in a sweep to the Thunder in the first round of the 2012 playoffs. Similar sentiments can be expressed for the Jazz, who lost in a sweep to the dominant San Antonio Spurs. With little depth behind Al Jefferson, Utah is not in a position to compete as aggressively as the Timberwolves are. Look for the younger squads to make a run—the Golden State Warriors and Minnesota Timberwolves will take over the final playoff spots come 2013. When Ricky Rubio tore his ACL last season, the Timberwolves knew it would be a very tough season. The flashy European point guard excited not only the Minnesota fan base but also the entire NBA. Watching plays like these can’t help you but to watch in amazement at someone who has the potential to become one of the league’s premier facilitating point guards. If Rubio can return healthy—in what seems to be no earlier than December—then the Timberwolves will have someone to lead the way on the offensive side of the ball and dish to Kevin Love, Brandon Roy & Co. The all-star forward in Minnesota is reminiscent of another big-time big man who played in the blue and black. Comparisons have been (and will be) continually made between Love and Garnett. The tendency of some analysts and fans to discredit Love’s efforts because of the lack of supporting cast is not valid. His night-in and night-out efforts have paid dividends and the results have followed. Love is one of the premier players in the NBA. Just look at the numbers that he put up just last season: 26.0 points, 13.3 rebounds and 2.0 assists per game to go along with a respectable 37 percent three-point shooting percentage. His player efficiency rating (PER) was top-five in the league. When your worst-case scenario is a “more athletic Antawn Jamison,” experts definitely have high expectations of you. And that is exactly what was said about the Minnesota draft pick, Derrick Williams. At 6’9”, Williams is a power forward who will likely spend time as the back-up and/or splitting minutes with Kevin Love. Greg Steimsma has also showed that he is a very capable role player in the minutes he was on the court for the Celtics in the 2012 playoffs. Nikola Pekovic is a 6’11” and 290-pound center who has established himself as a respectable big man. In 47 games played, Pekovic had an impressive 18.5 points and 10 rebounds per 36 minutes. With Love, Pekovic, Williams and Steimsma, the Timberwolves just may have one of the deepest front lines in the NBA. A former superstar, it was a very sad story to see Brandon Roy tell the Portland Trailblazers that he was retiring due to nagging knee injuries in 2011. But the Timberwolves managed to pull the three-time All Star out of retirement in 2012 free agency. According to NBA.com, Roy has shot .421 on field goals in game-tying or game-winning opportunities over the course of his career. If he doesn’t get re-injured (which is by no means a guarantee), Roy could be the piece that really helps Minnesota compete with the best in the west. The Oklahoma City Thunder have shown over the past two years that age does not amount to much. Making playoff-savvy teams look like nothing is a credit to the culture that GM Sam Presti and coach Scott Brooks have created in OKC, and Minnesota is capable of creating something similar. While they don’t have a Big Three of their own, the Timberwolves have a host of players capable of putting together a good season. With Ricky Rubio, Kevin Love and Andrei Kirilenko leading the way, Minnesota will land at least the number eight seed in the west in 2013. On paper, the Los Angeles Lakers have it all: incredible scorer in Kobe Bryant, gifted facilitating point guard in Steve Nash, and the league's best center in Dwight Howard. Add MWP, one of the league’s premier defenders and a still capable forward in Pau Gasol and the Lakers may rightfully be favorites to win the western conference. But a closer look at the top two teams in the West shows that the reigning champions (of the conference) are still set-up to repeat. First, a look at the run that the Oklahoma City Thunder made last season shows that they are an elite team. Although they didn’t win the NBA Finals, their playoff run was one for the ages. 10 of the past 14 NBA champions were one of the Los Angeles Lakers, San Antonio Spurs or the Dallas Mavericks. Oklahoma City beat each of those teams in one playoff run—not to mention they beat a Spurs team that was riding a 20-game winning streak. In those three playoff series until the Finals, the Thunder had a combined record of 12-3. OKC more than held their own against some of the league’s most playoff-savvy teams. 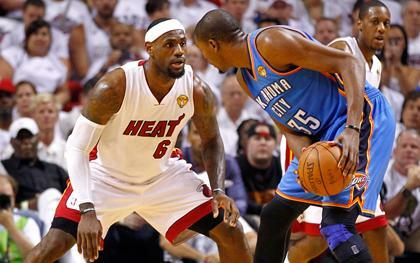 It should not come as a surprise that the Miami Heat were able to demolish a worn-out Thunder team. Miami only had to defeat the New York Knicks and Indiana Pacers in the first two rounds. While that’s not meant to discredit Miami’s run in any way—they were deserving champions—Oklahoma City’s run was impressive in its own right. With the Big Three in OKC still young and hungry for a title, they will come to play. 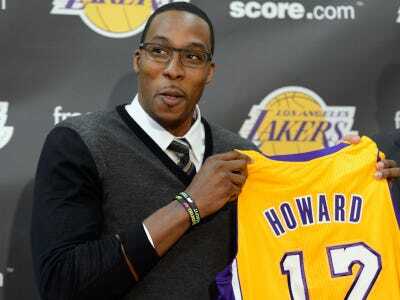 Dwight Howard in Los Angeles will not intimidate them. Add on the fact that it is a contract year for James Harden and Serge Ibaka (both have team options for next season), and the youth in OKC will continue to show that they are at the top of the NBA. Kevin Durant’s name hasn’t even been mentioned yet. The three-time scoring champion is a quiet, lead-by-example player who has ice in his veins (as he showed in the playoffs against MWP and the Lakers) and is only 23 years old. His personality allows Russell Westbrook to take the shots that he does. Think of it this way: in Kobe Bryant’s heyday (or even now), could a Westbrook and Kobe duo work? The answer to that question is a self-evident, resounding no. 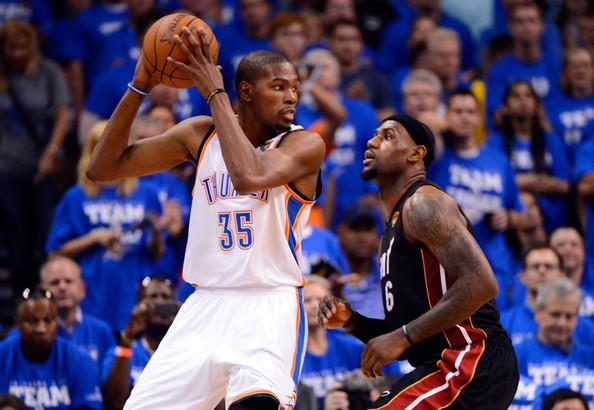 Kevin Durant is as unselfish a scorer as possible, maybe with the exception of LeBron James. He is the ideal teammate for those precise reasons—he is talented, unselfish and hungry. Now let’s have a look at the new-look Lakers, whose lineup presumably will look something like this: Steve Nash (PG), Kobe Bryant (SG), MWP (SF), Pau Gasol (PF) and Dwight Howard (C). As great as Bryant and Howard were on their own, they were both big fish in the pond. Remember how the Bryant-Shaq pairing turned out? Kobe Bryant may say that he is all about winning, and the media does encourage those thoughts, but he relishes the comparisons to Michael Jordan. He wants to be the greatest individual player of all time. Add on the fact that Kobe will not be the primary ball-handler with Steve Nash running point and it will be easy to see Kobe complaining that the Lakers early season struggles are not his fault. Remember how he railed Pau Gasol in the playoffs last season? With age comes impatience for a waning superstar and Kobe only has a couple years left (at least according to his word). If he does not perform like he expects to, Bryant will find a teammate or coach to place the blame on. Moreover, Andrew Bynum’s three-pointer, among other occurrences last year, showed that Mike Brown didn’t have the respect of his players. Following in the path of Laker legend Phil Jackson isn’t (and won’t be) easy. Scott Brooks, on the other hand, has already proven that his players say and do the right things both on and off the court. OKC defeated Tim Duncan, Andrew Bynum and Pau Gasol last year. 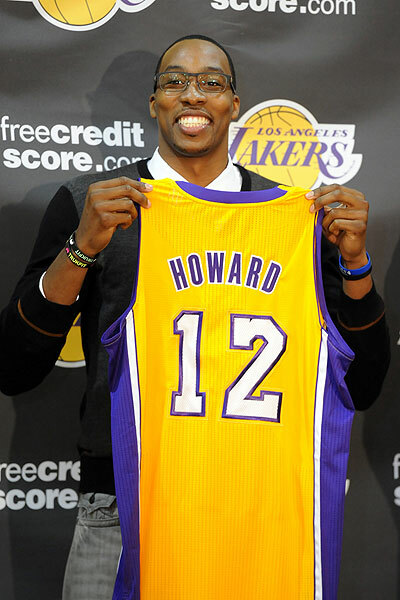 Overcoming Dwight Howard won’t be much more difficult. For the first time in years, the San Francisco Giants have a respectable offense. Led by the trio of all-stars in Melky Cabrera, Buster Posey and Pablo Sandoval, the Giants have put together an impressive season thus far offensively. Only one team in baseball has two players in the top-10 in batting average (Cabrera and Posey) and the Nationals are the only team other than the Giants to have two starting pitchers with ERAs under 3.00. Put together the following five reasons and the Giants have more than just a realistic shot at the National League pennant. As mentioned in the introductory slide, Posey’s .332 average is good for one of the best in the majors. That number is even more impressive when you consider his mediocre .289 first-half average. The nearly fifty-point increase has occurred in the 27 games since the All-Star break in which Posey has hit a scorching .449 with nine home runs. Posey may not look like the prototypical middle-of-the-lineup slugger but he gets the job done efficiently and effectively. He is a leader in the clubhouse and on the field, and someone who the Giants will certainly lean on when they make their playoff push. He showed he was capable of carrying a heavy load in their 2010 championship and has only gotten better and gained experience in his nearly two years since then. Nobody could have expected Melky “The Melk Man” Cabrera to have the year he is having for the Giants. His .348 average does not lie. Cabrera is becoming one of the games’ best, and the Giants could not be happier. He is a jovial player and someone who fits nicely into a clubhouse with personalities like Pablo Sandoval. The question is, though, would the Royals traded Cabrera if they knew what they now know? Ryan Vogelsong is a Cy Young candidate with his impressive 2.72 ERA. Matt Cain and Madison Bumgarner are top-5 in the league with identical 1.03 WHIP (a sabermetric statistic that measures baserunners per inning pitched). Tim Lincecum has been much worse than one would expect of a two-time Cy Young Award winner, but the Giants will retain hope that he can figure it out and decrease his abysmal 5.35 ERA. As fellow B/R featured columnist Kyle Brown pointed out, San Francisco’s bullpen may be a weak spot. But if the starters can limit the innings for the bullpen, that weakness can be hidden. Hunter Pence’s contract may be daunting, but if he plays to his true ability, he will be more than worth it. Pence has undoubtedly gotten off to a very slow start with the Giants, hitting .154 with one home run in 12 games in the orange and black. However, his energy is something that will benefit the Giants down the stretch and he does not have the same pressure that Aaron Rowand did when he came over from the Philadelphia Phillies. His three-run home run to give the Giants the lead in Sunday’s game against the Rockies may be the trigger that settles Pence down. Not only that, but he has Cabrera to lean on in the outfield. Pence will find his niche with the Giants. Once he does that, the San Francisco offense will be right there with the best in baseball. The current Washington Nationals, Cincinnati Reds and Pittsburgh Pirates are all very new to the playoff race. The Braves and the Dodgers are not even the best teams in their division, even though they are certainly legitimate threats in the playoffs. The core nucleus of the 2010 championship team is still in San Francisco, and even Melky Cabrera and Hunter Pence had some playoff experience (as members of the New York Yankees and Phillies, respectively). San Francisco still is not given the respect they deserve—and have earned—but they will once again show the nation that Giants baseball is here to torture not only Giants fans, but also the rest of baseball. View this article, which was originally published on Bleacher Report, here. With the added pressure of Dwight Howard and Steve Nash playing for the Los Angeles Lakers, 2013 will put a lot of pressure on the young studs that Sam Presti has brilliantly drafted as general manager of the Oklahoma City Thunder. They have made tremendous strides since their days as the Seattle SuperSonics but deep playoff runs only mean so much if you don’t have a ring to show for it—just ask LeBron James. 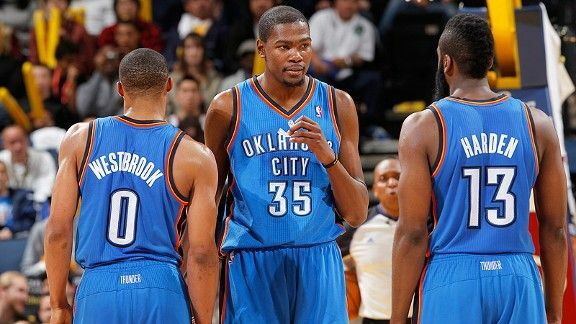 Russell Westbrook (23 years old), James Harden (22) and Kevin Durant (23) all have years before they’ve even reached their primes, which is a very scary thought. But they have and will be sure to demand the money they are worth. And then the question becomes: can Oklahoma City hold onto all of their Big Three? And should they if there is no championship banner? Some of the cellar teams can afford to spend a year or two fine-tuning a roster or sticking with a player that has potential they haven’t quite lived up to. But Oklahoma City was three wins away from a title in 2012. They have excellent team chemistry behind bright, young coach Scott Brooks but they don’t have offensive support in the post. The Miami Heat can look to Chris Bosh and the Los Angeles Lakers now have Dwight Howard (and, of course, the San Antonio Spurs still have Tim Duncan). If they can’t pull it together next year, something has to change. There is no way the front office will be satisfied with these playoff appearances—and they should not be. When you have Kevin Durant to build around, you should be a perennial championship contender. And there is no way that Durant is going anywhere. So that means each and every other player in the starting lineup will be open to trade talks. Serge Ibaka and Kendrick Perkins are elite defensive presences which could provide viable trade bait for the Thunder. Russell Westbrook is a top-10 player in the NBA which warrants the consideration of a big man from possible suitors if the Thunder can figure out the right deal. And James Harden may be the odd man out after his abysmal performance in the 2012 NBA Finals that included back-to-back games shooting 20 percent from the field. Which starter(s) the Thunder deal depends on four factors: 1) Perry Jones III, 2) potential trades available, 3) 2013 performance and 4) money demanded by the player. If Perry Jones III pans out to be a respectable forward/center at 6’11” then Oklahoma City may be more inclined to get rid of the $9 million that Perkins is due in 2014. Jones performance could also warrant an addition to a trade if OKC decides to trade Westbrook or Harden. In terms of how they play in 2013, if it ends up in a championship then Presti will do everything in his power to retain the young core that the Thunder have. But if Ibaka and Harden demand too much in free agency and the Thunder haven’t won a title they will be on the trading block with Westbrook in the midst of a 5-yr/$80 million contract. There are endless permutations of possibilities for the Thunder to work with—and one thing is certain if 2013 doesn’t pan out the way 2012 did for Miami: things will change and players will be moved. The Oklahoma City Thunder may eventually have to part ways with Serge Ibaka (or Kendrick Perkins) but are for now blessed with a big man who has sky-high potential. Hakeem Olajuwon would be the perfect tutor for Ibaka for various reasons. Olajuwon has shown he is willing to reach out to current NBA players like LeBron James and Dwight Howard, so if Ibaka can manage to spend some time with one of the NBA’s greatest centers of all time, he would be wise to take full advantage of it. Olajuwon has already reached out to OKC coach Scott Brooks regarding Ibaka. Here are five skills that Serge Ibaka could learn from Hakeem Olajuwon and make a push at becoming an elite center/power forward. The consensus last year was that the Oklahoma City Thunder really needed an offensive post presence. Although it was masked by two of the NBA’s most prolific scorers (three-time scoring champion Kevin Durant and point guard Russell Westbrook), Ibaka and Perkins did not provide nearly enough lift offensively. Most often, Scott Brooks would have to choose one or the other to play center and have Kevin Durant play power forward because having two players who cannot score the basketball on the court at the same time is a huge liability. Not only that but it allows an extra man (and a half) guard Durant or Westbrook whether they sag off Ibaka or Perkins or simply double a scorer. Olajuwon is known as one of the best offensive big men of all time. In fact, Pete Newell said Olajuwon has “the best footwork [he’s] ever seen from a big man” (per NBA.com). You don’t get much higher praise than that. So, if Ibaka could figure out something even remotely similar to the Dream Shake (video above), he could become more of a weapon and less of a liability for the Thunder. Over his career, Ibaka averages less than seven rebounds per game. That needs to change—especially if he is going to be a primary big man. While there is truth to the statement that defensive presence is more than just statistics, rebounds do have quantitative value: namely preventing offensive rebounds and allowing your team to get transition opportunities. Hakeem Olajuwon averaged over 11 rebounds in his career. He could likely briefly watch some tape of Ibaka and suggest the best way for Ibaka to improve his rebounding. It may be something as simple as effort and boxing out, or it may be more intricate—perhaps transitioning better from being a shot-blocker to a rebounder. Either way, this would be something that would significantly improve Ibaka’s overall game. Although Ibaka is already approaching the league’s elite big men, his offensive game isn’t quite there. Perhaps more importantly, his mindset and outward appearance isn’t there yet. Too often we see Ibaka running up and down the court looking too much like a nice guy. The center position isn’t meant to be friendly—people don’t call it “battling” for rebounds for nothing. Hakeem’s sustained success in the NBA can always come back to his mental composure and appearance. Just look at some of the league’s best centers in recent memory (Shaquille O’Neal and Dwight Howard): something in their swagger is intimidating. Breaking backboards does tend to do that to an opponent. To be fair, Serge Ibaka is already one of the league’s best shot-blockers. In fact, his league leading 241 blocks was over 100 more than the second-place finisher. But just imagine where Ibaka could be if he got some tips from the NBA’s all-time blocks leader. And going back two slides, if Ibaka can learn how to rebound and shot block effectively he will be right up there with Dwight Howard as the league’s best defensive presence. All of the aforementioned skills are useless if Ibaka cannot coexist with Durant and Westbrook. That’s not to say that he hasn’t been already, just that offensively Westbrook likes to handle the ball a lot and shoot early in the shot clock while Durant is capable of taking over games with the ball in his hands. Hakeem knows what that’s like, having played with one of the NBA’s 50 greatest players, Clyde Drexler (who I have interviewed). Preparing Ibaka to gameplan with Durant and Westbrook and prepare to create opportunities for himself is critical in order to remain on the floor and in an Oklahoma City uniform. He already has a decent jump shot—if he can become more of an offensive threat he will make his way up near/to the top of the NBA’s best big men. In an exclusive interview with one of the NBA’s greatest players of all time, Clyde Drexler talks with me about everything basketball. Going from the Olympics to comparisons to the Dream Team and his life after basketball, Drexler and I had a friendly 15-minute discussion. Elijah Abramson: First let me say that I really appreciate the time that you are taking. 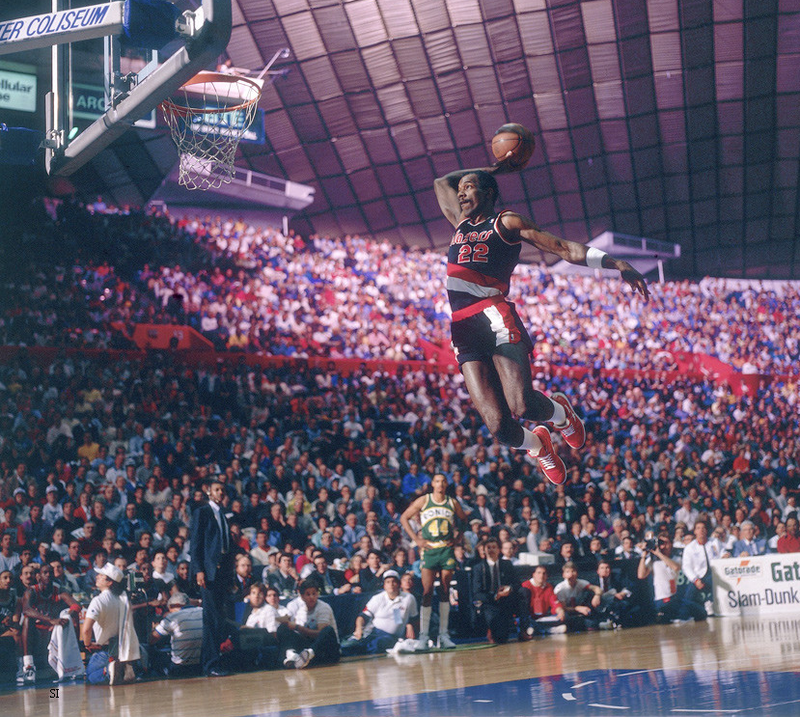 Clyde Drexler: It’s my pleasure. 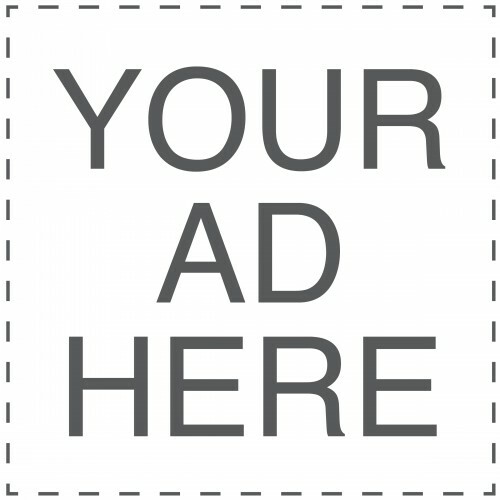 EA: So what do you see as the significance of LeBron James’ triple double in the Olympics [first in US Olympic history]? CD: He is by far and away the best player in the game. He does everything all the time. EA: Definitely. So with LeBron and Durant doing what they’re doing, how do you think that they’re going to fair against the rest of the field, in particular, Spain? Is Team USA a lock for the gold medal? CD: I’m really impressed with how well they’re playing. They’re putting it out there on the line and having great success. I was impressed when I saw them play Spain in an exhibition game before the Olympics and they beat Spain, in Spain, by 22. Spain really thought they had the US. That was a convincing moment for me to say that I don’t think anybody is going to come close. EA: On that same subject, there’s been a lot of talk about limiting the Olympics to the younger guys in the NBA, like Anthony Davis. Do you like that or do you prefer seeing the best the NBA has to offer going out and representing the US? CD: You can’t go wrong either way, but an age limit should be around 30. EA: You don’t think Kobe should be playing? CD: No, I think he should be allowed to play and it’s a wonderful thing. He’s a phenomenal player—still the best offensive player in the game. 30 is a good age to have if you have to have a limit. As long as it’s the same [for all sports]. EA: I wrote an article comparing you and the Dream Team to 2012 Team USA. How do you think the two teams compare and what do you think of Kobe and LeBron’s comments on that comparison? CD: Those guys have every right to say the things that they do because they’re very good. Obviously I’m a little bit biased. It would be close, but at the end of the day we would beat them by 25 to 30. EA: So you think it’s going to be close but you’ll beat them by 25 to 30? Actually…I don’t think there should be an age limit, [the older athletes] get so much fan support. Why would you want to limit that? I’m going to change my comment. There should be no age limit. EA: What about the NBA fans and owners who are worried about injuries? Teams don’t want their best players going out there because they are making their money in the NBA. CD: I can understand that aspect because you play hard for nine months and your body needs to rest. By doing the Olympics, your body does not get to rest. Guys have to gauge where they are and learn how to manage. EA: Being from the Bay Area I don’t have too much affection for Bryant and the Lakers but what do you think about the comparisons that have been made between Kobe, Jordan and LeBron? And you got someone who might become one of the all-time greats down there in Golden State. Klay Thompson can shoot it. EA: Yes, he played really well last season. EA: In terms of age limit, do you like the rule that the NBA made that makes players go to college and the subsequent one-and-done road that John Calipari has instilled? Or would you prefer to see guys come out as teenagers? CD: Like I said, as long as you keep it the same between all sports that’s good. Education is worth its weight in gold. Make no mistake about it. But remember we’re only talking about two or three kids a year. For the most part, these kids need two to three years in college before the NBA. But if you’re such an exception, it should be an opportunity. One-and-done is not a bad rule. All kids need to figure out how to manage their time as young adults. But whatever you do [about age limitations], do it for hockey, baseball, basketball… The double standards are ridiculous. EA: Talking a little bit about yourself, what was more important to you: your gold medal with the Dream Team or your NBA championship in 1995? CD: Oh, that’s like choosing what child you like best. (laughs) You’re just trying to do the best you can. It’s just an honor to play the game and do things of that nature. EA: Now you’re a color commentator for the Rockets, how has that been? CD: It’s been great, keeps me involved with the game. My son and I go to a lot of the games. EA: As a former player, do you ever get that itch to play or are you ready sit back and see your kids play? CD: I retired at 35 in ’98 and thought there’s only one place to go and that’s downward. I retired at a good level. I was at peace after 15 years—I was lucky to play that long. I love the game and played from 13 to 35 almost every single day. Since I retired, I haven’t woken up one morning and said, “you know what? I’m going to go play basketball!” But I just did the SF Half Marathon last year, so I still stay in decent shape. [Basketball] was a job. It was a lot of hard work but I was glad when it was over—it was like running a marathon. EA: You mentioned you retired when you were still productive, so what do you think about Kobe’s comments about retiring at 35? He said he would retire then when he was coming into the league. CD: I think there is a lot to be said about that because you put a lot of pressure on your cardiovascular system and it’s tough on your long term health. I think if you’re lucky enough to make it 15 years, [you need to realize] that’s a lot. EA: Great, thank you again for your time. CD: You are quite welcome. If you would like the chance to speak with Clyde Drexler, he will be chatting live with USA Basketball and Olympic fans in ConnecTV’s Watercooler this Friday, August 10 at 1:30pm ET.